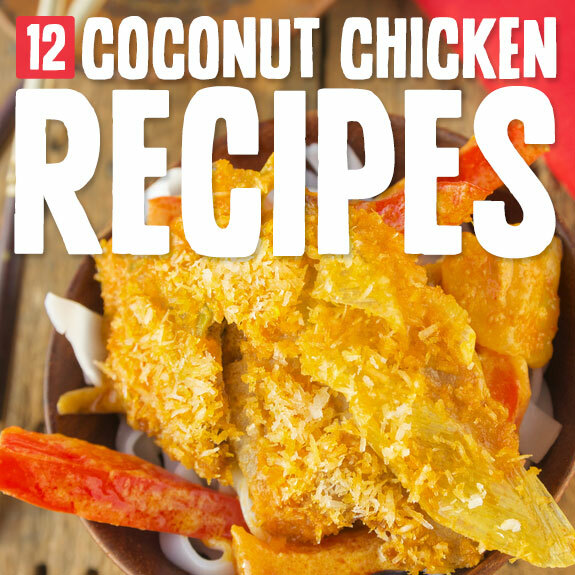 These Paleo coconut chicken recipes all conform to the approved ingredients list, and do a good job of bringing big coconut flavor to your chicken. You’ll find some that use vegetables to help make it taste amazing, and others that use tested winners like lime to accentuate the flavor. Here they’ve figured out how to put the lime in the coconut and put both of them into the chicken. They pull this off by infusing the flavor in the chicken with a marinade made from coconut milk and lime juice. You let the chicken sit in the marinade for 3 hours, although they say you can leave it in overnight if you’d like. From there it’s just a matter of cooking up the chicken according to the directions and serving with your favorite Paleo vegetable side dish. Chicken salad usually comes out tasting delicious, and when you make it the Paleo way you won’t have to worry about why it tastes so good. 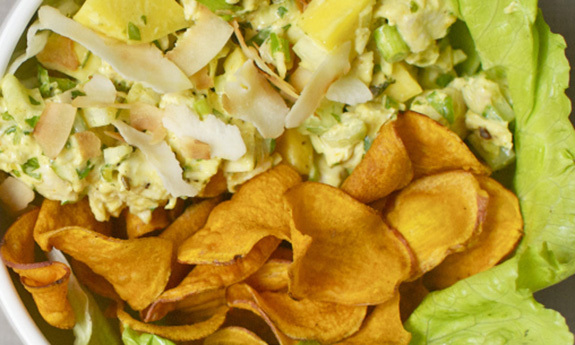 Here they’ve come up with a curried chicken salad, and added toasted coconut and mango to the mix. Toasting the coconut really amps up the flavor, and it’s worth the time and effort of freshly toasting raw coconut flakes until they’re golden brown. The coconut really puts the finishing touches on this meal, and it all goes nicely together with the taste of curry, mango, and coconut. 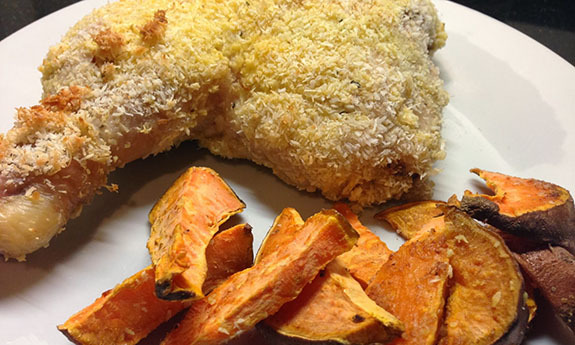 Chicken fingers made the Paleo way will include no breading made from grains, so coconut flakes work very nicely. Not only does it give the chicken fingers the crispy coating they need, it provides coconut flavor that you just don’t get with flour. 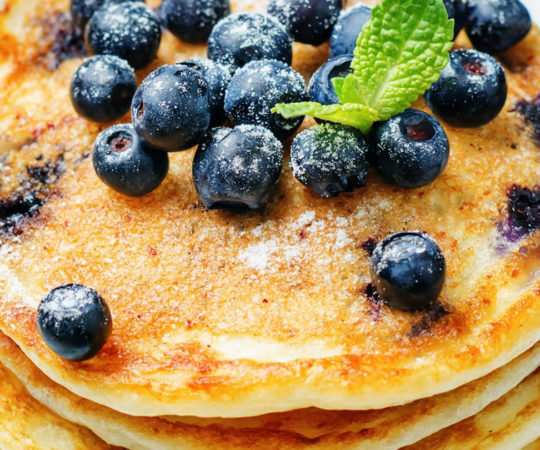 The main thing to take away here is that we’re using unsweetened coconut flakes, because the sweetened kind you find in stores are going to contain heaps of refined sugar. 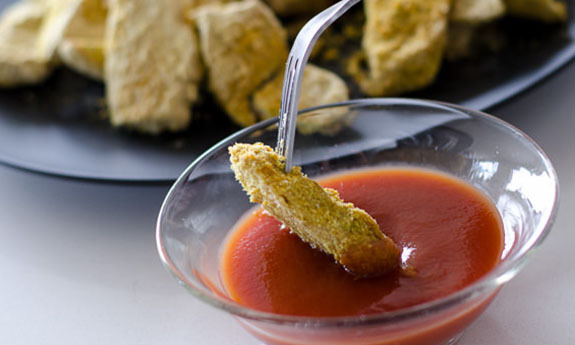 Almond meal helps to add the distinct chicken finger coating while adding fiber to the equation. Serve up with cauliflower as shown and you’re getting your veggie along with your meat. 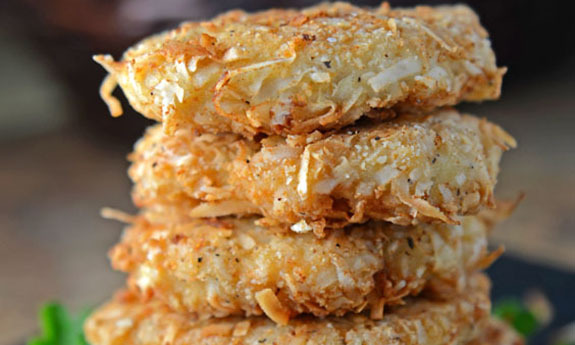 These chicken patties are crusted with coconut much like the chicken fingers above. They come out a beautiful golden brown, and you simply can’t beat the taste of coconut that’s been fried to a golden brown. They have these patties served next to a batch of sweet potato chips, which will be a good way to add some fiber and a vegetable serving, but really these can be served up alongside just about any vegetable for the perfect meal. They’re using almond flour to help coat the chicken and this gives you some fiber which is important on Paleo. Another coconut and lime offering, this chicken gets absolutely covered in coconut and lime flavor. This is like Shake n Bake chicken because you put the coconut and some almond flour into a bag and shake it up so that it gets coated evenly. The lime is zested right into the mix so you’ll be able to taste it throughout the entire piece of chicken. 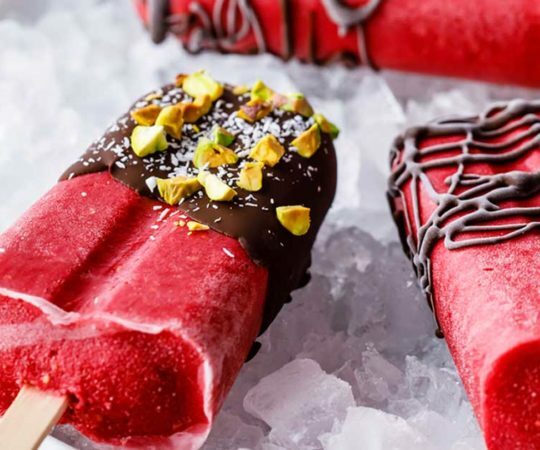 This means that you’ll be getting both the taste of lime and coconut with each bite. Use the big chicken leg like they request and you really will feel like a caveman. Here’s a soup that captures the essence of coconut chicken and puts it in a form that you can eat with a spoon. You’ll love how they figured out how to make a thick and creamy soup without any dairy. 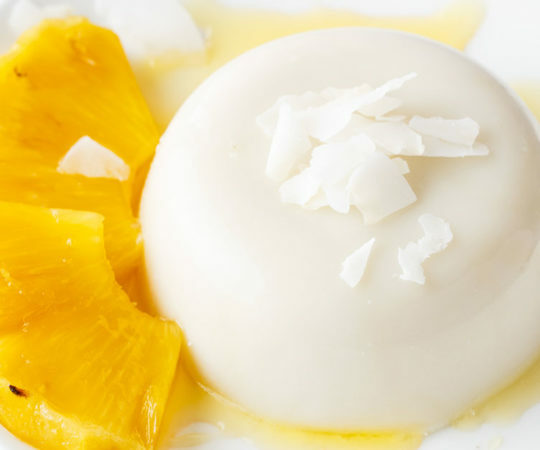 The trick is to use coconut milk and coconut flour, which keeps with the coconut theme here. Both of these ingredients add to the coconut flavor, while making for a thick, creamy soup. 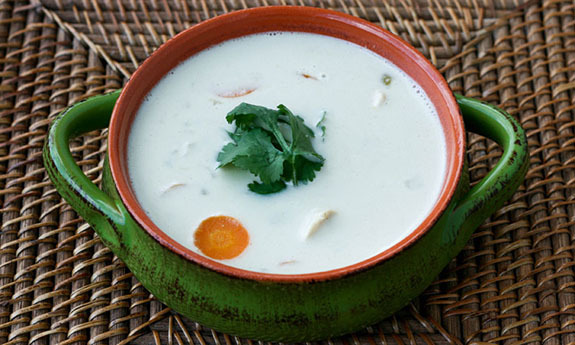 The coconut flour adds fiber to the soup, and the coconut milk keeps it dairy free. 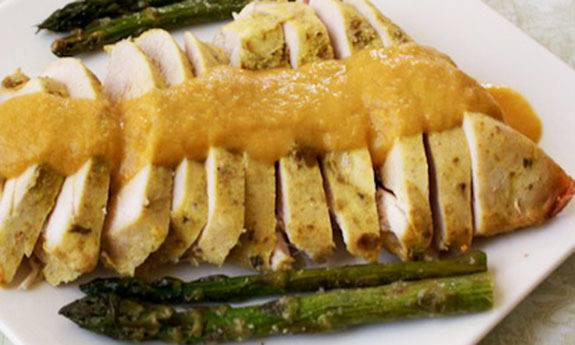 Organic chicken breast adds all of the meaty goodness you could ask for. This chicken makhani has a ton of flavor, and if you’ve never tried it before you owe it to yourself to give it a go. It’s better known as butter chicken, and this particular makhani is made with coconut cream, so it has a coconut flavor all the way through it. The end result is that you get a very robust tasting dish that doesn’t use any butter or any other dairy, but still delivers massive traditional flavor. This is due to the use of garam masala, a blend of Indian spices that not only taste great, but have shown to have health benefits as well. Making curried chicken doesn’t have to be hard, especially when you’re using the slow cooker. 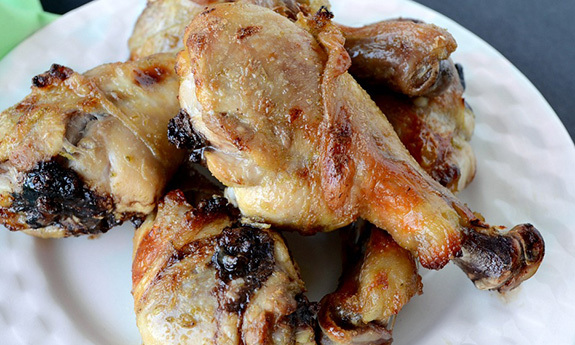 You’ll still end up with a perfectly cooked chicken, and it will be bursting with coconut flavor as well. The coconut comes from coconut cream, so you’ll also be getting a nice creamy texture with this chicken. The coconut cream actually gets made into a gravy that is poured on top of the curried chicken. With so many competing flavors your taste buds will enjoy sorting it all out. Curries can be a little intimidating at first if you’ve never made one before. This recipe is a great one to follow if you don’t know where to start but want to give it a try. It uses both pumpkin and sweet potatoes so you’ll get plenty of flavor. 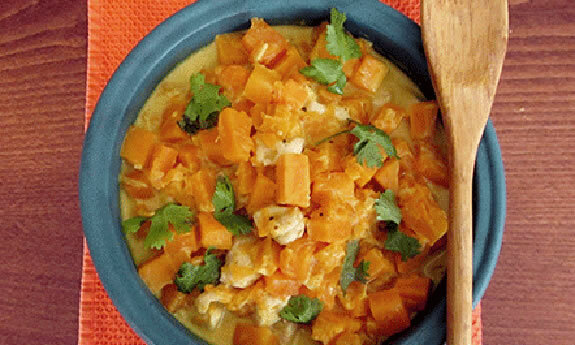 The coconut in this curry comes from coconut oil and coconut milk, so you’ll receive plenty of healthy fat while at the same time you’ll be getting fiber from the pumpkin and sweet potato. Sweet potatoes are high in beta-Carotene, helping your body fight free radical damage. 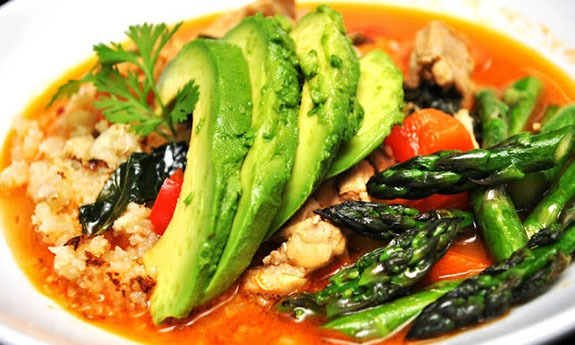 Thai chicken curry is a crowd pleaser, and to make it the Paleo way you only need to make a few modifications. 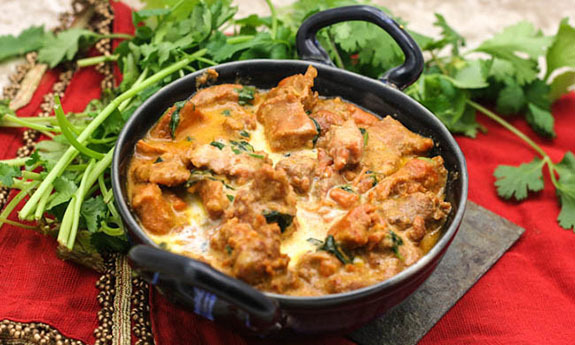 This recipe does a great job of keeping things Paleo while infusing the curry with coconut oil and coconut milk so you’ll be getting coconut flavoring throughout. The curry itself consists of plenty of healthy ingredients including chicken thighs, mushrooms, asparagus, bell pepper and zucchini. It truly is a perfectly balanced Paleo meal in a bowl. Each ingredient helps add to the nutritional total of the meal as well. 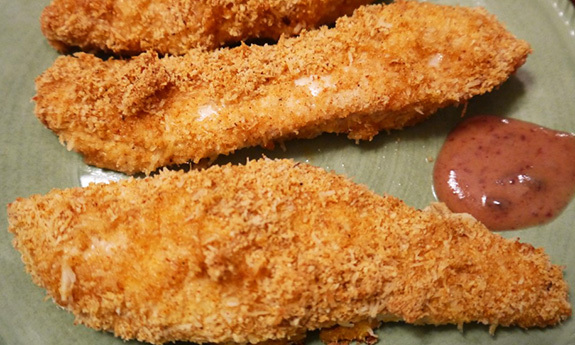 Bake up these chicken fingers and you’ll be sure to have a happy family on your hands. 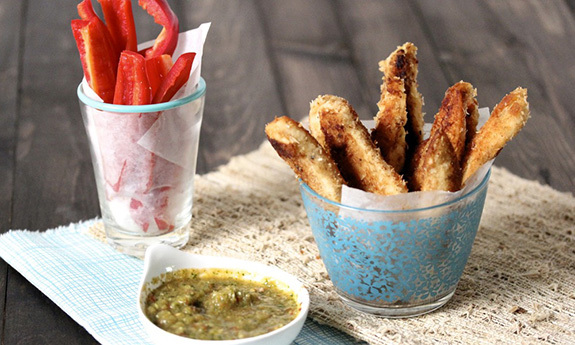 They are made with coconut flour and curry powder to give them their coconut curry taste. This makes it really easy to give the fingers massive flavor without worrying whether it’s Paleo friendly or not. 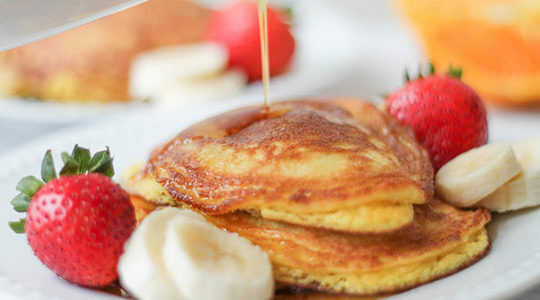 Coconut flour is a Paleo approved flour and ends up adding fiber to the fingers that you wouldn’t otherwise get. All spices are Paleo friendly so you can flavor up your meals as much as you’d like. 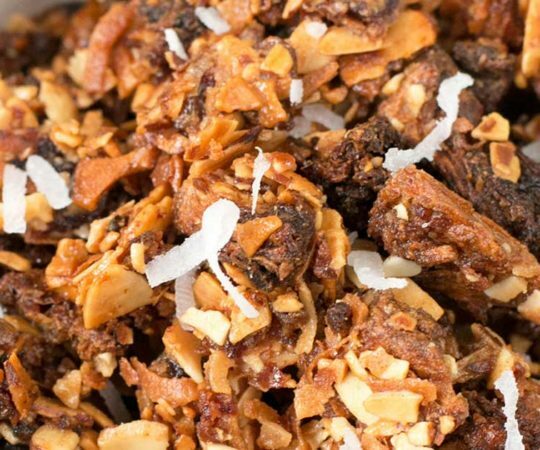 These strips of chicken have been given the coconut treatment, and are sure to be one of your favorite Paleo snacks. 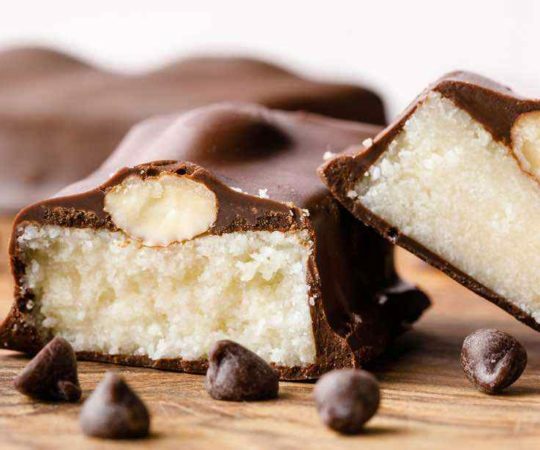 You simply can’t avoid getting coconut each time you bite into one, because the coconut is stuck right to the chicken and there’s both coconut flour and coconut flakes for more coconut flavor. Don’t miss the pineapple dip that comes with these, as it makes them taste even better and is made with all Paleo ingredients.